A few weeks ago sweet Deena broke her leg again. This time it was her left fibula/ tibula. Ramya was in a not-so-great mood (company had just left and she doesn't transition well when people come in and out of the house). She decided to try race Deena, though Deena told her she didn't want to race and wasn't racing herself, and accidently swung around and kicked her in the leg. It was an accident, but hard enough to break her bones. 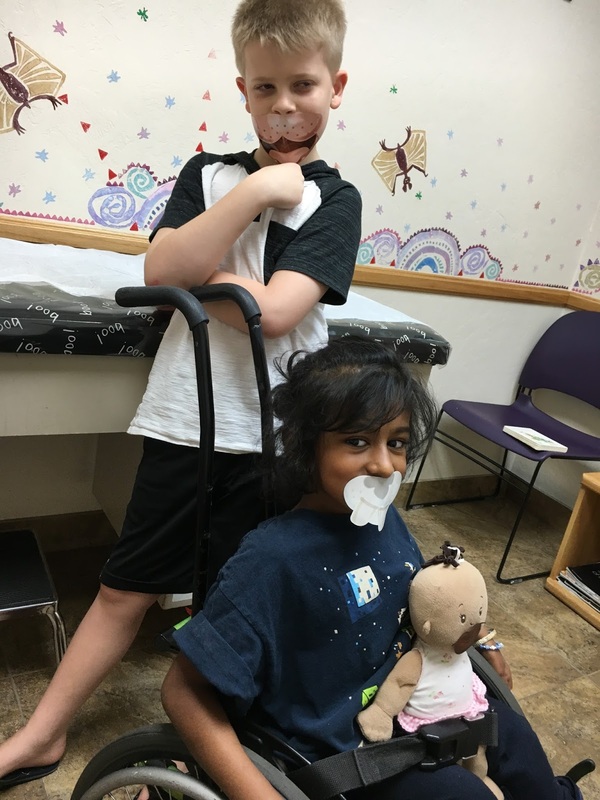 Ramya is an all-or-nothing kid, with no middle, and she was in a funky mood, so it's all it took. Deena's lower leg bones are very curved and need rods, but we were waiting a bit to get a few more PAM infusions in her first. For now, they are just very, very fragile. Deena only cried for about half a minute, and was mostly just yelling at Ramya and calling her mean. She asked me to splint her leg, so I did, and then she told me she was fine. I kept noticing little things, though, that made me think she was favoring it. When I would ask her, she would say she was fine and not in pain. She was putting partial weight on it, scooting all over the house, bending at the knee, moving her toes around, and playing like normal, but something seemed off. I called the orthopedic surgeon's office, explained what happened, and they told me to watch her and continue to evaluate her, then decide if she needed to come in. I continue to watch her and was still stumped, so I called and told them I needed to bring her in. When the doctor took off the splint he cold tell it was likely broken because she cried and didn't want it touched. In hindsight, I should have probably done that myself earlier but I'm learning and new to all this and it just didn't occur to me. She seemed happy and comfortable with the splint, so I left it on. 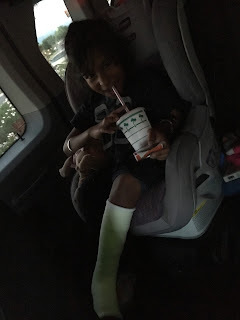 Anyhow, long story short, she is the VERY proud owner of a glow-in-the dark cast. I'm hopeful that, with the incentive of a very cool cast, she will be more likely in the future to tell me if she is hurt. I'm not sure if she's just so tough and she's used to being in pain that the splint helped enough to where she wasn't in pain, if her pain tolerance is just so high she didn't realize she was hurt, or if she didn't want to be taken in so she hid it from me. She had told me she hurt her legs a few months back in the pool, but when I took her in, it was fine. She was acting pretty much exactly the same this time, but this time she wasn't fine. It's still hard for me to read her, which is just really hard. I'm praying in the future it will be easier to distinguish if she is ok or not.